Say good morning to Tattoo ... He is the only puppy surrendered during a commercial mill rescue because he had mange. Sadly, we also found out is he has kidney issues and drinks gallons of water. So far all tests have come back negative for different diseases but he is not growing like a normal Newfoundland. His future health is still very uncertain. 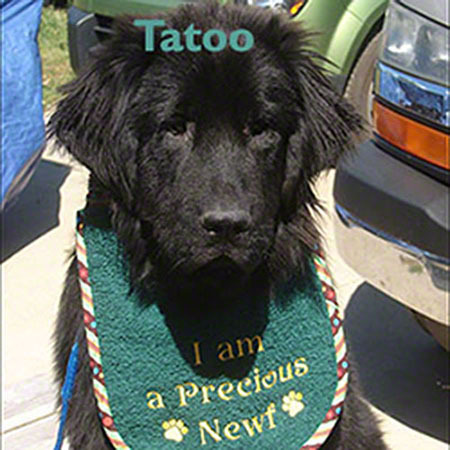 Please support NCA Rescue's commitment to every precious Newfoundland with your donation today - 100% of you donation dollars will go directly to helping Newfoundlands in need. NCA Rescue is 100% volunteer run and all administrative costs are covered by the NCA. Donate to the NCA National Rescue Network today to help us continue this important work!